The first thing I learned from my sensei was ‘empty your cup.’ Many martial arts teachers are concerned more about how much you are willing to learn than what you already know,” she insists. “Just empty the cup before making any judgments and learn everything you can; that’s my philosophy in martial arts and that’s my philosophy in life. Of course, what you already know is very important, but sometimes relying too much on experience could prevent you from learning new things. To most martial artists, the thought of learning a new discipline is tantamount to studying a new language. Leaving your comfort level, abandoning the forms and applications you have worked so hard to master, takes a rare combination of confidence and humility. That’s one reason why black sashes in one system are seldom willing to “empty their cup,” to begin at the beginning, to admit they don’t know everything. Starting over is never easy. Besides martial arts, Sayaka has been dancing and performing since the age of 4, and her original plan was to pursue a career in performing arts as well as medicine. But a freak sky diving accident, combined with the length of time it would take to become a doctor, force her to re-examine the alternatives. Sayaka recently graduated from university with honors. “It was another big challenge that I had to overcome – going to school, working in the office, dancing, modeling, commercials, auditions, martial arts training, supporting myself and family abroad and taking care of my own health – all at the same time. Her latest entrance into the unknown is the sport/art of wushu, which she is leaning from Hames Hu & Jenny Tang at the Southern California – based Tai Chi Wushu resource. 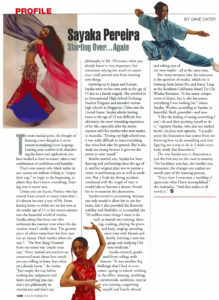 “it has many components of dance, but is also has power, everything I was looking for,” relates Sayaka. Wushu, according to Sayaka, is beautiful, fluid, powerful – and new. The way Sayaka sees it, frustration is just the first step on the road to mastery. The hardships you face, the hurdles you encounter, the changes you endure are merely part of the learning process.